Summary: Herein we present five cases of submasseteric abscess that most commonly occurred in patients with a history dental disease. CT has been the main imaging method for diagnosing lesions in the masticator space and adjacent to the mandible; however, we found that, in some of our cases, CT defined the lesion poorly or not at all. In some cases, MR imaging defined the lesion better. Radiologic manifestations of this condition and pathologic correlations are discussed. Submasseteric abscess is a localized, often chronic, infection between the masseter and the mandible. This location is normally only a potential space but provides a protected space for the development of an occult abscess. Although cases of submasseteric abscess have been reported in the otolaryngologic and dental literature, the findings associated with infection in the submasseteric space have not, to our knowledge, been analyzed in the radiologic literature. Most of the patients in this series presented with chronic symptoms and were initially misdiagnosed. The delay in treatment was several years in some cases. The radiologic findings can be subtle, especially in more chronic cases. We present five cases of submasseteric abscess with CT and MR imaging findings. The radiologic manifestations of this uncommon entity and pathologic correlation need to be understood so that appropriate treatment is not delayed. Five cases of submasseteric abscess were obtained from teaching files of the senior authors (A.J.S., L.M.) over the past 10 years. Three patients were women and two men with an age range of 16–50 years. Clinical information was obtained from the referring physician or the patient and supplemented by hospital records. Imaging was performed at our institution and also at outside hospitals. Four of the cases were surgically confirmed. In one case (patient 4), no surgery was performed and the diagnosis was not pathologically confirmed. Because of convincing clinical and imaging findings, however, the case is included. This patient developed facial swelling and trismus approximately 6 months after removal of a lower left third molar. A diagnosis of infection was not made after initial CT and sialography; however, subtle signs of chronic infection were present on the initial CT examination, including diffuse thickening of the masseter, suggesting myositis, and sclerosis of the mandibular ramus, compatible with an adjacent chronic inflammatory process (Fig 1A). Symptoms persisted for 6 months, and repeat CT performed after intravenous administration of contrast material showed progression of the previous findings of myositis and sclerosis (Fig 1B). 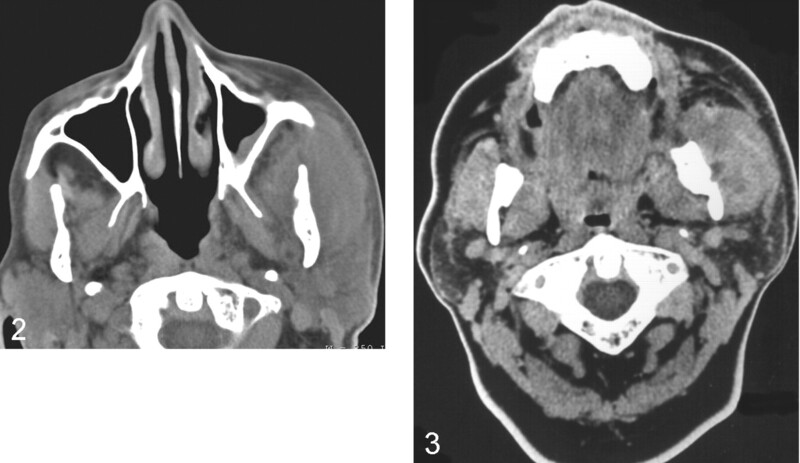 A, Noncontrast axial CT image shows myositis of the left masseter muscle with diffuse swelling, but without significant surrounding inflammatory change or definite fluid collection. The parotid gland is normal. 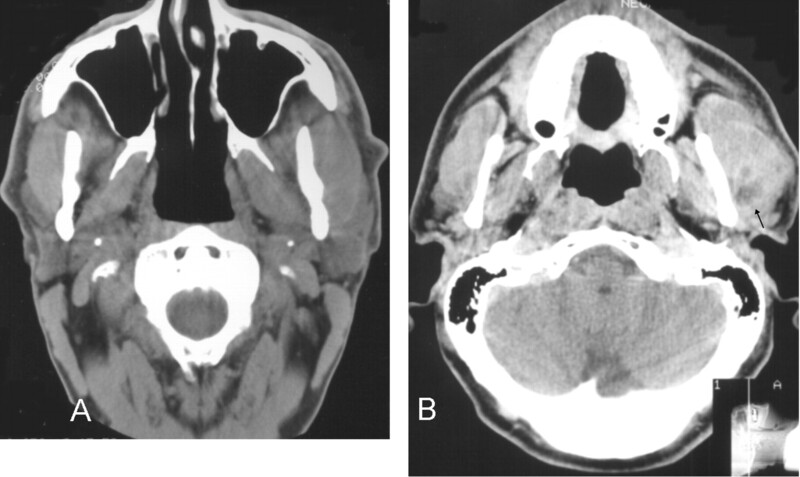 B, Six months later, postcontrast axial CT image shows increased masseteric swelling and mandibular sclerosis with a discrete area of low attenuation (black arrow) with probable rim enhancement, suggesting the presence of an abscess. After removal of a left lower molar, the patient developed left facial swelling. She received antibiotics, but facial swelling increased over 1 week accompanied by trismus. On presentation at this hospital, the patient was unable to open her mouth more than 3 mm. CT (Fig 2) showed diffuse thickening of the left masseter muscle without focal fluid collection. Bone windows showed early sclerosis of the mandibular ramus. Intraoral incision and drainage yielded 15 mL of purulent material. Eventually, the patient developed osteomyelitis of the mandible that required further treatment. Patient 2. Noncontrast axial CT image, soft-tissue view, shows diffuse thickening of the left masseter muscle with a suggestion of cortical thickening of the left mandibular ramus. This patient developed spontaneous facial swelling. There was no history of dental symptoms or procedures. Because of trismus increasing over 2 months, the patient sought medical attention. Physical examination showed diffuse swelling in the right masseteric region. Palpation revealed a mildly tender, firm, nonfluctuant mass. There was no fever or leukocytosis. The presumptive diagnosis was parotitis. Dental radiographs at presentation showed an impacted third mandibular molar with a large follicular cyst. CT showed diffuse thickening of the masseter muscle, compatible with myositis, and a small focus of low attenuation, possibly representing a fluid collection (Fig 3). At surgery, a transoral approach to the submasseteric space yielded 2 mL of purulent material from an infected dentigerous cyst, which had ruptured through the buccal side of the mandible. Cultures yielded findings of Streptococcus viridans. Patient 3. Postcontrast axial CT image shows diffuse thickening of the left masseter muscle with a small, low-attenuation area, but without clear rim enhancement, possibly representing an abscess. Bony sclerosis of the mandibular ramus is present with a focus of cortical disruption of the mandible laterally (better seen on bone windows) at the level of the abscess. A 17-year-old previously healthy female patient developed spontaneous facial swelling. After several months, the right lower third molar was removed. The swelling persisted without fever or trismus. MR imaging obtained several months later at an outside institution showed a fluid collection beneath the right masseter (Fig 4A–C). There was also sclerosis of the right mandibular ramus with masseteric thickening. The findings were compatible with chronic submasseteric abscess. No surgery was performed, and the patient continued to have episodic facial swelling with a variable response to antibiotics. The infection may have begun as a pericoronitis around a partially erupted tooth or as an infection associated with an unerupted tooth, but the abscess was not surgically confirmed. A, Axial spin-echo T1-weighted image (500/20 [TR/TE]; number of signals averaged [NSA], 2256 × 224; section thickness, 5 mm) shows enlargement of the right masseter muscle with a subjacent curvilinear collection of low signal intensity believed to represent pus. B, Axial fast spin-echo T2-weighted image (7100/125; NSA, 2; matrix, 256 × 224; section thickness, 5 mm) shows an elliptical mild high signal intensity zone lateral to the mandible corresponding to the low signal intensity seen on the T1 image and consistent with pus. Higher signal intensity between this collection and the masseter muscle probably represents edema and myositis. C, Coronal spin-echo T1-weighted image (450/20; NSA, 2; matrix, 256 × 256; section thickness, 5 mm) shows thickening of the right mandibular ramus with low signal intensity within the marrow cavity consistent with cortical thickening and sclerosis of the marrow space. A 43-year-old female patient had an 18-month history of episodic right facial swelling and fever that first occurred 3 weeks after multiple mandibular injections of local anesthesia for a dental procedure. A presumptive diagnosis of parotitis was made. The initial swelling subsided after a course of antibiotics, but swelling recurred many times with temporary improvement on administration of antibiotics. No significant pain, but a variable amount of trismus, was present throughout this period. Physical examination revealed no evidence of dental disease or mucosal inflammation. There was no fever or elevated white blood cell count. CT showed diffuse thickening of the right masseter muscle with subjacent region of heterogeneous attenuation, possibly representing a fluid collection. Sclerosis of the mandibular marrow cavity was also present (Fig 5A). MR imaging acquired without administration of contrast material showed focal high signal intensity on the T2-weighted images, findings compatible with an abscess, with low signal intensity in the marrow space (Fig 5C). Transoral surgery revealed purulent green material in an abscess, along with yellow granules compatible with sulfur produced by actinomyces. The organism, however, failed to grow in culture. A, Postcontrast axial CT image shows diffuse thickening of the right masseter muscle with a region of mildly low attenuation posteromedially. B, T2-weighted axial MR imaging shows a more definite fluid collection posteriorly as well as a region of high signal intensity anteriorly within the right masseter muscle compatible with edema and myositis. C, Noncontrast coronal T1-weighted image shows T1 shortening within the collection, which is mildly hyperintense relative to muscle. This probably represents proteinaceous fluid. In 1948, Bransby-Zachary (1) first described the submasseteric space. In an effort to explain normal explorations of suspected parotid infections, he undertook cadaveric dissections. Previously, the masseter was said to have a broad, continuous insertion on the lateral aspect of the ramus of the mandible, but he found a bare area between separate attachments of deep and middle portions of the masseter muscle resulting in a potential space. Infection from a posterior molar could track posteriorly and become sequestered there as an abscess, thereby explaining the clinical findings. 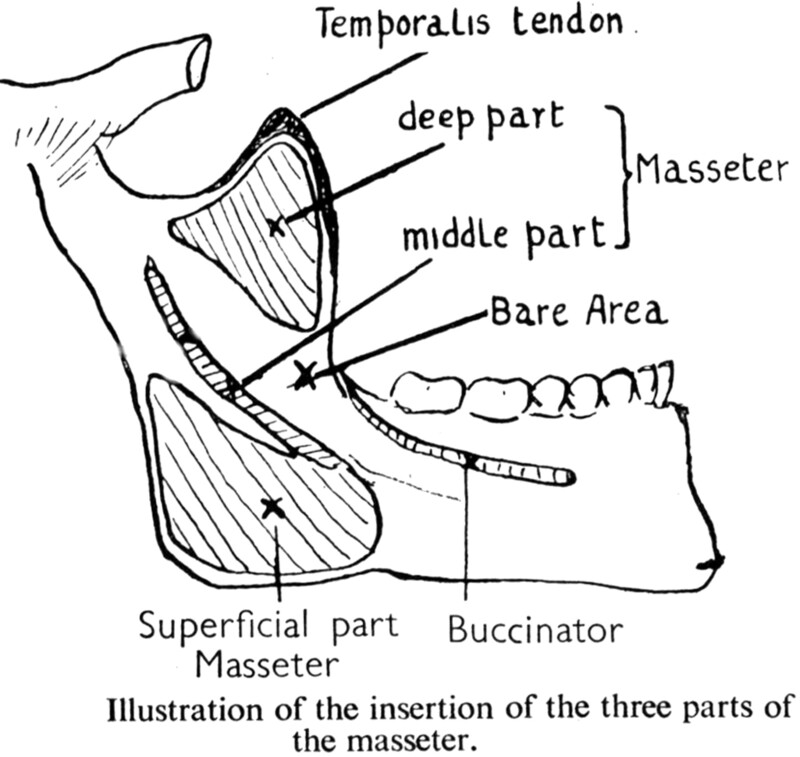 The submasseteric space, a subdivision of the masticator space (2–4), results from a division of the masseter muscle into three parts: superficial, middle, and deep. All three parts originate on the zygomatic arch. Bransby-Zachary found that the insertion of a small, deep portion was limited to the lateral surface of the coronoid process and upper third of the ramus of the mandible. Insertion of the largest, superficial portion was restricted to the lower third of the ramus, especially posteriorly at the angle of the mandible. The middle portion was the smallest and inserted along a thin line curving posteriorly and superiorly over the middle third of the ramus (Fig 6) (1). Original drawing by Bransby-Zachary illustrating the insertions of the masseter (reproduced with the permission of British Dental Journal 1948; 84:10–13). Although MacDougall (5, 6) dissected 141 cadavers and could not find a discrete submasseteric space, he reported an area of loose attachment between the middle and deep layers of the muscle that could present an incomplete barrier to infection and thereby provide a potential space for abscess formation. The presence of such a potential space along the ramus of the mandible between the insertions of the masseter muscle has been confirmed by one of the authors (L.M.) (Fig 6). Although to our knowledge there are no reported cases of infection beneath the masseter muscle in the radiologic literature (2, 3, 7–10), there are many such reports in the dental and otolaryngologic literature (5, 11–17). In these, the anatomic and clinical aspects of the disease are well described, but the radiologic manifestations are not. Analysis of our cases revealed several radiologic findings that we believe are suggestive or specific for this entity. In the four patients who underwent CT examination, no definite fluid collection was identified despite pus being drained at surgery. These patients had episodic pain and swelling for a period of weeks up to 18 months. No fluid collection was seen on the noncontrast examinations. On postcontrast studies, one failed to reveal a discrete collection (Fig 5A), the second showed a small low-attenuation area without enhancement along the mandible that could possibly represent a phlegmon or an abscess (Fig 3), and the third showed a definite abscess with rim enhancement 1 year after the patient’s initial presentation (Fig 1B). Several other studies (3, 8, 9, 13, 14, 17) have failed to show a definite fluid collection despite such a finding at subsequent surgery. Thus, the absence of rim enhancement may suggest a phlegmon, but the presence of pus at the time of surgery confirms that CT findings may be falsely negative even with administration of contrast material. In our series, this may be due to the chronic nature of the infections and resultant increased attenuation of the pus that is isoattenuated relative to muscle. In addition, partial treatment with antibiotics may contribute to the chronic nature of the condition by amelioration of systemic symptoms (ie, local infection may persist, unrecognized in a protected site, and progress to a chronic phase [5, 11, 12] without surgical drainage ). Such partial treatment may account for the typical absence of systemic signs and symptoms at the time of clinical presentation (5, 8). Instead, there is usually firm, relatively painless, nonfluctuant facial swelling with progressive trismus (13–15) that may mimic parotitis or tumor (8, 15). Concomitantly, the usual radiologic signs of acute infection, such as rim enhancement and infiltration of adjacent tissue planes, are rarely apparent on CT images. Diffuse swelling of the overlying masseter or myositis was present in each case in our series and explains the symptom of trismus. The CT examination also showed sclerosis of the underlying mandibular ramus, first described by Mandel (11), in every case. Although this finding is suggestive of osteomyelitis, only one of our patients developed clinical signs of osteomyelitis following surgical drainage of the abscess. However, findings of myositis and bony sclerosis, when seen together on CT images, should suggest the presence of an infectious process. MR imaging was obtained in two of our cases. In patient 5, the MR imaging showed a definite fluid collection beneath the right masseter muscle despite a postcontrast CT image that failed to show such an abscess (Fig 5A). Patient 4, who did not undergo CT, had MR findings demonstrating an obvious collection beneath the right masseter with abnormally low signal intensity of the underlying mandibular ramus (Fig 4C). This was our only surgically unconfirmed case. The patient was treated with multiple courses of antibiotics and continued to experience periodic facial swelling. We believe this represents a submasseteric abscess. Neither patient received intravenous gadolinium before imaging. In the head and neck, CT plays a primary role in differentiating cellulitis from abscess and in guiding surgical drainage (3). However, the superior soft-tissue contrast offered by MR imaging provides improved visualization and differentiation of masses and inflammatory changes compared with that of CT (18). Because CT has failed to differentiate between different masseteric masses, it has been predicted that MR imaging will become the dominant technique for evaluation of this region as availability of MR systems improves (10). Because MR imaging relies on T1 and T2 relaxation instead of attenuation of ionizing radiation to generate contrast, MR imaging is more sensitive to chronic fluid collections that are unapparent or uncertain on CT. We found MR imaging provided markedly improved definition of the abscess in one case in which both CT and MR imaging were performed (Fig 5A and B), and MR findings were clearly positive in the other case in which CT findings were not available (Fig 4B). In the case report by Fielding and colleagues (17), a medial masticator space abscess was unapparent on CT but easily visualized on MR images. We believe that MR imaging is underused for evaluation of this region and may be preferable to CT as an imaging technique. Submasseteric abscess in the era of antibiotics is often chronic and misdiagnosed (1, 11, 13). Radiologic criteria concerning this lesion are scarce. CT may fail to show the typical findings of an abscess, but findings of masseteric enlargement and bony sclerosis of the mandibular ramus should raise suspicion for an underlying infection. MR imaging will frequently show a fluid collection and lead to more rapid diagnosis and expeditious treatment. Poster Presentation at the American Society of Head and Neck Radiology, Annual meeting, Denver, Colorado, September, 2001. Accepted after revision October 8, 2002.